Use of the ChallengeRocket Platform (available on https://challengerocket.com) is only possible after accepting these Terms and Conditions. We suggest that you carefully read the following content. We use these basic terms throughout the Terms, and they have specific meanings. You should know what We mean when We use each of the Terms. “User” - any person using our Platform, and any organization or person using the Platform on an organization’s behalf. 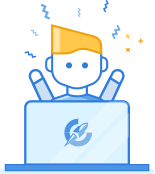 “Account” - maintained by ChallengeRocket for the User - under a unique name (login) and password protected - a set of resources and services in which the User's data and information about his activity are collected. “Registration” - Account creation procedure. “Platform” - any website, application, or service offered by ChallengeRocket, including content and electronic communications via https://challengerocket.com/. “Event” – contest, challenge, promotion or competition organized or host by Organizer or ChallengeRocket, which is described or promoted on Platform. “Organizer” - User organizing the event. “Participants” - User participating in the event. “ChallengeRocket”, “We,” “Us,” and “Our” - ChallengeRocket Sp. z o.o. headquartered in Rzeszow (Poland) entered in the Register of Entrepreneurs of the National Court Register under no. 0000638669, (Head office: pl. Wolności 13/2, 35-073 Rzeszów, Poland, Wroclaw office: Rynek 60/U6 st., 50-116 Wroclaw, Poland, phone +48 790 226 753, office@challengerocket.com). These Terms define the rules and technical conditions for the provision of electronic services by ChallengeRocket via Platform, as well as the terms of concluding and terminating agreement for the provision of such services, as well as the complaint procedure. In the absence of consent to be bound by the Terms, you should immediately leave the Platform. As well If You break the Terms, we may suspend or terminate Your Account. Platform services are provided on 24/7. To be able to use the Platform it is necessary to connect to the Internet and a web browser that allows displaying HTML documents available on the Internet via a WWW service on the User's end device. ChallengeRocket provides the Platform “as is” and “as available,” without warranty of any kind. Users can be natural persons who are over 18 years of age and have full legal capacity, legal persons and organizational units without legal personality, but who can acquire rights and incur liabilities on their own behalf. Users can be people who are 13 years old but under 18 years of age to the extent that they can acquire rights and incur liabilities in accordance with the provisions of generally applicable law. If You're under 13, You must ask your parents or legal guardians for permission to use the Platform before registering and sending any information about yourself. Due to GDPR regulations, ChallengeRocket has the right to verify the age of User. Browsing the content of Platform does not require registration. To be able to fully use the services of the Platform, registration is required. In order to register, the User completes the registration form. The registration of a legal person and an organizational unit without legal personality may be made by a person who is authorized to perform all activities related to the Terms on its behalf. After registering, the User gains access to the Account. Registration can also be made using a Users` account on an external platform, e.g. Facebook, Google or GitHub. ChallengeRocket is not responsible for the actual identity of the User. The User is responsible for all data provided during registration. The User may not use the Account of other User and share his Account with other persons, except for making the Account available to persons duly authorized by the User to act on his behalf. The User should keep the Account password secret. ChallengeRocket does not charge for the use of the Platform, subject to services indicated. Information on prices of paid services can be found in the “Pricing” tab. Users are responsible for all fees, including taxes related to the use of paid Platform services. Access to paid Platform services is defined by ChallengeRocket. ChallengeRocket is not a party to contracts concluded between Users (User and the Organizer). Organizers are solely responsible for the performance of contracts that they have concluded with Participants via Platform. ChallengeRocket does not bear the responsibility for information provided by Users. User is responsible for all activities that occur in his Platform Account. If it is found that any content posted by Users on the Platform infringes the law, in particular intellectual property rights or personal rights of third parties or is contrary to the Terms, any User or Guest may report this fact to us by sending an e-mail on address: office@challengerocket.com. comply with applicable laws and respect all rights of other Users or third parties. any content of other Users without their express consent. 17. It is prohibited to provide illegal content by the User via Platform. revealing personal information to third parties. User may at any time opt out of using the Platform by closing his Account, which results in termination of the Agreement immediately. However, in this situation, User remains liable to ChallengeRocket and other Users for posted content and other liabilities arising prior to the liquidation of the Account. To close your account, just send us the appropriate information via email. We have the right to terminate the Agreement with the User with immediate effect or to block the Account in case of violation of the essential provisions of Terms. Platform enables Users to post their data for the purpose of obtaining and posting information about events. Platform also allows Organizers and to view Users profiles and to obtain information about Participants taking part in a given event. Using the Platform ChallengeRocket can publish marketing information about ChallengeRocket or our partners and information about sponsored events. ChallengeRocket is a legal entity registered in Poland, so therefore We provide personal information about Users in accordance with the Regulation (EU) 2016/679 of the European Parliament and of the Council of 27 April 2016 on the protection of natural persons with regard to the processing of personal data and on the free movement of such data, and repealing Directive 95/46/EC (General Data Protection Regulation/GDPR). ChallengeRocket is the controller of the Users1 data, who are natural persons, within the scope of their data provided during registration or published on the Platform. The Users` data controller can also be the Organizer regarding the data of the Participants of his event. Therefore, ChallengeRocket can process Participants’ data on the basis of art. 28 GDPR on behalf of the Organizer. ChallengeRocket is not responsible for compliance with the rules of protection of personal data by the Organizers with GDPR regulations. In any case, before registering for the event, we recommend Participants to read the information provided by the Organizer. By placing content, in particular images, materials or statements on the Account, the User grants to ChallengeRocket a non-exclusive license to use, record in the device memory, delete, supplement, public performance, public display, reproduction and dissemination (in particular on the Internet) of this content. Users should be treated as the sole owners of all intellectual property rights to works created as part of organized events - unless the rules of the event say otherwise. In the case of improper quality of services of the Platform, User is entitled to submit a complaint by sending an e-mail on address: office@challengerocket.com. brief description of the comments and objections. Complaints are processed immediately, no later than within 30 days. Terms and conditions of the Platform will constantly be available on the: www.challengerocket.com/terms-and-conditions.html. These Terms are the only document defining the rules of the Platform. In duly justified cases, we reserve the right to change the provisions of these Terms. ChallengeRocket will inform Users about each change of Terms. If the User does not agree to the changes made, his account will be deleted. Violation by the User of any of the provisions of the Terms, in particular, providing false personal information, violation of law or good manners authorizes us to ban the User from access to Platform with no right to restoration.